IMPORTANT NOTE: This post covers old information on the client libraries. Please read this post for updated information. The first time you use Google+ and .NET, it can be a little tricky to get things working. This article will cover a few of the basic steps to save you some time. I have uploaded a sample implementation that includes a few minor changes like fixing the cut/paste requirement used to demonstrate that the key is extracted from the page. Download the C#/Google+ app. You will need a Google+ API for client applications generated from the Google API Console. Most important in this flow are the Client Secret and Client ID. You will then have a class, Plus.v1.cs, and a DLL, Plus.v1.dll, that can be included in a project to enable access to Google+. Note You should not use both the DLL and the static generated class. You now have the latest set of samples from Google for .NET, an API key, the Google+ library, and are ready to create a project in Visual Studio. For this project, just create a basic WPF app using the wizard from Visual Studio. Next, add a few references to the project by right clicking the references section of the solution explorer and using the browse function for adding references. It can be easier to do this by copying the DLLs to a separate folder than referencing the DLLs from the samples directory for your mercurial clone. Note I am using Plus.v1.cs as opposed to using the library to make debugging easier. Now you should add the DLL or generated class that was created in the first step and your prereqs are satisfied. this simply calls an Authenticate method that is described in the next section. The library abstracts away some of this but the following code shows how the calls are formed. The following code forks a separate process and blocks the app until the auth code is copied from the web site to the app. At this point you will have the auth code that you need to set up the client. At this point, you have an authenticated client and are ready to perform API calls. This example is a little hacky but is enough to get you started with the .NET library. This is exciting because you can take advantage of the Windows platform and can integrate things lie Google+ functionality into your apps if you’re targeting Windows. how to get friend from google+? but how can I get the Access Token and use it in my code without opening Popup windows? I have a windows form application that i want to get the login with the google plus and i get the all the information about profile and insert into databse, and i have access token and app id. 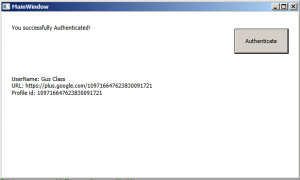 I have a web application and i want to post comment on google + in c#. 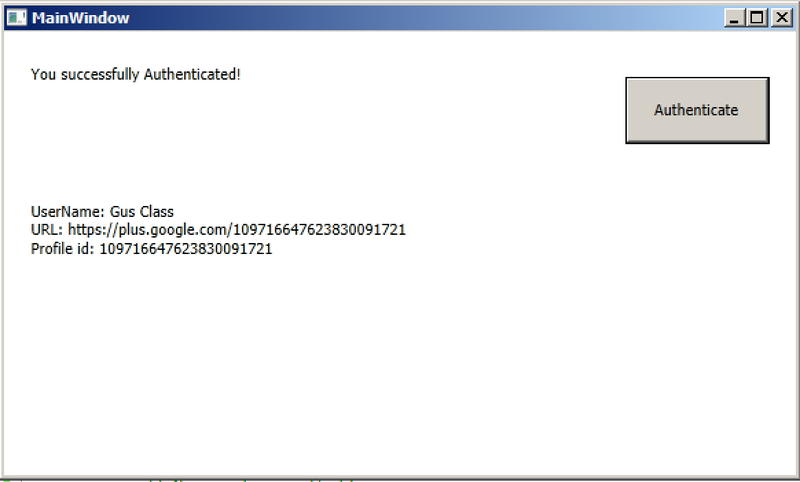 This currently isn’t possible using the Google+ API. Check on https://developers.google.com/+ for the latest references on what you can do with the API.